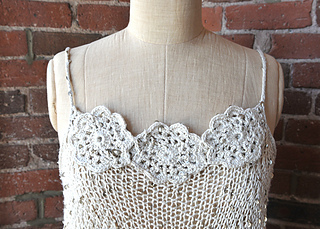 This beautiful open knit tank is just the ticket for your spring wardrobe! 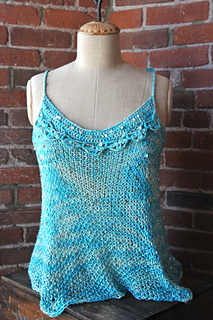 This swingy tank calls for 4 skeins of our Stargazer Silk yarn. The pattern is one size but because of the open seed stitch and loose silhouette it will fit most body types. The tank straps tie at the shoulder, making them easily adjustable too. 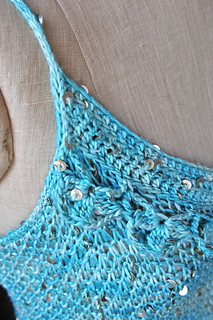 The Stargazer yarn adds a little sparkle and embellishment. In the pattern, we give two yoke options to try. 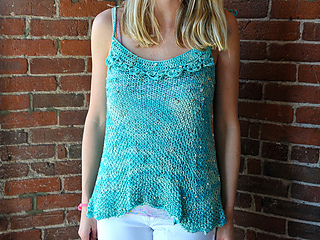 The first one is a scalloped crochet that you see in the blue top. 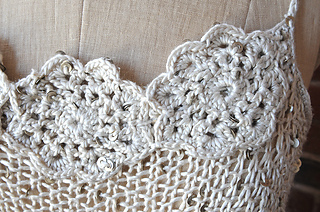 The second option is the crocheted flowers you see in the ivory top. If you’re inspired you can also come up with your own pretty crochet to add in here.